2018 has finally come to an end, what a year it has been! Since becoming an Organiser, I have had the pleasure of meeting with members all over Victoria, from Bairnsdale to Bendigo and everywhere in between. Members have welcomed me to the Union with open arms, thank you for your support. Looking forward to 2019 we have numerous enterprise agreements up for negotiation, Metro, V/Line and Probe. This will make for some exciting times ahead. We have met with Delegates from all providers and compiled a log of claims to move forward in negotiating a fair agreement for all rail workers, improving conditions and increasing pay rates in line with the cost of living. In the year ahead we welcome the new mobile myki which is currently in trial stage with the trial about to head into the second stage of testing. Body camera trials for Authorised Officers and Station Staff, due to the high possibility of being assaulted and the roll out of new Vlocity trains, which pose a few issues requiring risk assessments to be done prior to them being rolled out into service. Safety for our members will continue to be at the fore front of issues heading into the new year. We all agree that members should go home at the end of the day safely. I will continue with the issues faced at the PTV call centre relating to pay and conditions and continue to work with the Delegates to improve things so all members can have a safe and secure workplace. In 2019 I intend to roll out more monthly Delegates meetings in areas that have never held meetings. These meetings are crucial in the workplace as they create accountability and communication channels to openly resolve issues. Again thank you all for working with me in 2018 and I look forward to seeing you all in 2019. And for all members working over the Christmas and new year break, thank you all for hard work and efforts keeping our system moving. We have been in negotiations for some time now about a new Pacific National Enterprise Agreement for Terminal Operators. Delegates and representatives from across each Branch of Australia have been involved in the negotiations for this National agreement. Negotiations between the RTBU and Pacific National have occurred regularly over the last nine months. 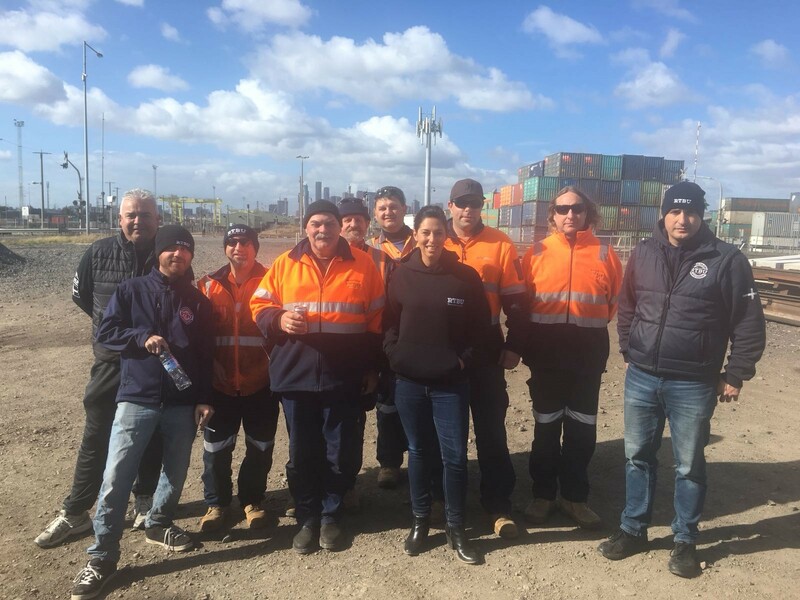 Our Delegate from Victoria Adam McGrath has been part of the negotiations with our Industrial Officer Alice Dunn to get the best agreement possible for our members. Throughout the negotiations we pursued many claims on behalf of our members. Unfortunately Pacific National would not agree to some of our most important claims including fair wage increases, full remuneration for all sick leave and wage parity across the country. Pacific National’s proposed agreement has now been voted down by 78% of members nationally and it has sent a clear message to management that the RTBU will not sit down and accept a shonky agreement. A negotiation meeting has occurred on Wednesday 12 December after the agreement had been voted down and it was clear that Pacific National clearly heard the no vote from the membership. We are yet to reach an agreement with the company but I am hopeful that this will occur early in the New Year. We will continue to fight to get the best deal possible for members, and I look forward to pushing forward in 2019. RTBU members in front-line roles would be aware of a media release from the Minister for Health Jenny Mikakos and the new Minister for Public Transport Melissa Horne. The media release outlined a new plan to have ill passengers removed from trains in order to minimise delays and inconvenience to the travelling public. In this proposal, Authorised Officers, public transport staff, Protective Service Officers and Victoria Police are asked to help unwell passengers off the train. This all sounds well and good in theory, however front line members know that it is still far from sunshine and daisies. The RTBU has been given no information as to the proposed timeline towards implementation and how they plan to engage with the RTBU moving forward. The RTBU has been given no information as to on who’s authority a passenger would be moved and where will liability rest in the event of further injury or complication. The RTBU has been given no information as to who was involved in conducting the review and why the RTBU was not included, nor has a copy been made available. The proposal is based on the assumption that sick passengers will have access to essential facilities if they are moved onto a station, however the vast majority of stations across Victoria remain unstaffed without basic amenities. Defibrillators are available only at a handful of stations. Not all front line public transport staff are trained in first aid. No clear policy and procedure has been discussed with the RTBU that would provide members with the confidence required to facilitate such a change in practice. The network is currently under resourced to meet current and growing demand before consideration is given to the additional duties demanded by this proposal. After discussion with members around this, I have written to both Ministers highlighting the above concerns and asking for clarification. I have also requested that the review document be made available and that the RTBU and our Delegates are engaged in consultation to ensure any issues can be resolved. I have also written to the CEOs of both Metro and V/Line to get some information as to whether they have agreed to this proposal. It will be extremely disappointing if the companies have agreed to this new procedure with the Government without any consultation with the people who are expected to perform this task, the members. We are yet to receive a response from the letters and we will update members as further information becomes available. Until then, status quo will remain. It’s raining gold in rail. Projects are falling out of the sky, we have the Metro Tunnel, Airport link, Ballarat duplication, proposed electrification to Wallan, and the suburban rail loop on the cards and only 29 of the now 75 grade separations completed. It appears that our industry has a lot to look forward to. All these initiatives are great for our industry with much needed investment after decades of stagnation. But I can’t help but ask the question, who will do the work? The Victorian rail industry has traditionally expanded and contracted very slowly and there is a definitive finite number of members who have the skills to deliver these projects. These skills have been developed over decades of working in the industry, often through sheer experience. You don’t have to look further then the Murray Basin project to see what happens when you undertake a project with no clue as to what you are doing. A company with minimal rail experience entering into a joint venture with a company with less rail experience was never going to end well. Employing a largely fly in fly out Labour Hire based workforce who didn’t have the competencies initially to as much as work on the regional network, on downright dangerous rosters, delivering a dead set shambles of a project that doesn’t achieve what it set out to achieve in the first place, blowing out initial costs, and ultimately wasting tax payers money. Not a lot of upside to that. Experience is a dear teacher someone important once said and the Murray Basin project should teach the State Government and the operators a valuable lesson. In order to deliver these projects in the manner they were intended and have a positive effect on the network and make good use of tax payer money, there must be a plan. For one, tendering panels need to look past price, a big factor in the Basin debacle, but more importantly there needs to be co-operation between contractors and if needed, intervention by the State Government to ensure continuity between projects. Giving members the opportunity to go from job to job developing their skills to be a much needed asset to the industry as the network expands is crucial. If this means a project must be delayed in order to maintain continuity, surely that is a small price to pay to deliver a project that actually works, and skills that will serve the industry for decades to come. Safety matters. Everyone deserves to return home safe. As you are reading this article Metro is forcing fatigue rostering into the Signalling grade. Signallers have refused Metro’s draft proposed rosters and drafted their own proposed rosters which meet all compliance in terms of good faith bargaining, however Metro have refuted and are ramming in the 8/6 roster rotation. This is extremely concerning given that the work group have formally declined the 8/6 rostering however the lead manager of the Signalling department seems to have his own agenda and continues to force this roster in against the wishes of the work group. If Metro decide to insist on their proposal, the RTBU will take this matter further to ensure our members are not required to work these fatigued rosters. Another ongoing dispute in the Signalling grade is the Train Service Officer roles. Metro are implementing yet another level of management named Signalling Duty Managers at an additional cost. Again, not in good faith bargaining. This is now in formal dispute and we are going through the formalities and will hold Metro to account to keep their promise which was made in a meeting with the General Manager of Operations. 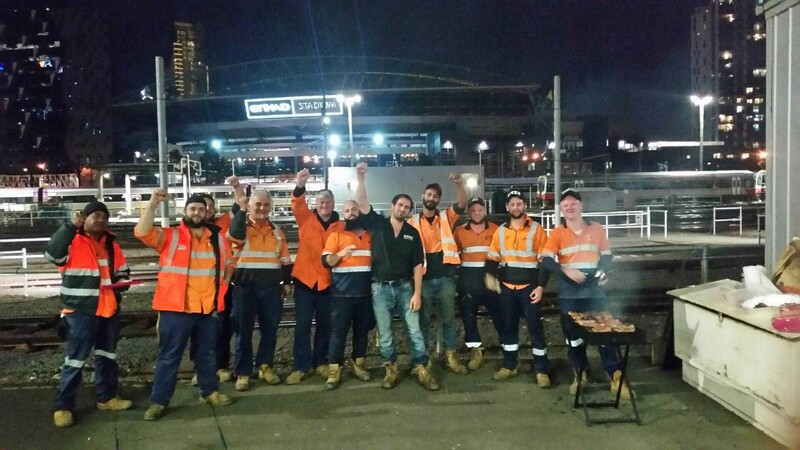 V/Line management is utilising Conductors on available shifts to do customer service duties at Southern Cross Station and in regional areas. A number of meetings have occurred around this and V/Line have promised that a letter would be sent to the RTBU regarding the agreed outcomes from the meetings where Delegate and officials were present at each meeting. Currently I have not received the letter promised. I extended the deadline for this, however still have not received a letter so I am now left with no choice but to put in a formal dispute regarding this messed up process that V/Line have created. As we say, game on!